One Just Cause 3 multiplayer mod has been cancelled because its lead developer got hired to work on Just Cause 3. The creators of the popular Just Cause 2 multiplayer mod were hard at work on a version of the mod for Just Cause 3, but they have announced "the indefinite halt of JC3-MP development." Why? Well, it's for the best of reasons. The lead developer of the mod has been hired by Just Cause creator Avalanche Studios. In a post on the mod's official site, Lead Developer Trix (whose real name is Cameron Foote), made the announcement. "Several months ago, I (Trix) was approached with an offer I couldn't refuse: to join Avalanche Studios Sweden as a developer so that I could work on projects present and future." 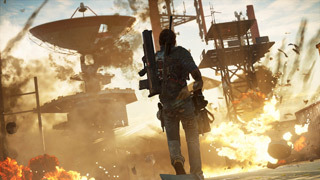 Fans of the game will likely be excited at this news, as it may signal that Avalanche is planning to bring multiplayer to Just Cause themselves. Fans of the mod will be less excited, as Foote's departure means that work on the JC 3 version will come to a halt. "Unfortunately, due to time constraints, neither I or the rest of the team can actively pursue development on JC3-MP; our lives are just too busy to allow for it right now," he wrote. The mod team does plan to continue to maintain the popular JC 2 multiplayer mod, but will not be adding any new features. Instead, the focus will be on fixing bugs and maintaining stability. The news is disappointing for Just Cause 3 fans, but there is still the multiplayer mod being developed by the nanos team that we told you about last week to look forward to.